But one of the not so pleasant memories is of mother’s mega-decluttering sessions where she would toss out stuff without you knowing. In one of these sessions she threw out all the cooking books! When I found out, I was devastated. There was one book that I had loved so much and it was gone. The Encyclopedia of European Cooking was published in 1962 – before I was even born. I remember devouring the recipes which were organised by country or region. The recipe that fired my vampiric imagination the most was the Finnish “Blood Pancakes!” Not surprisingly it also turned my stomach!! I mourned the loss of that cookbook and often thought about it when I was researching and creating recipes for my own cookbooks. Then, decades later, I was reading an article on the history of food in the cooking section of one of our newspapers. It was written by the owner of a shop called Books For Cooks. My mouth dropped open – a bookstore with just cooking books in it!! I had to get there and fast. Luckily it wasn’t too far. The staff were so wonderful and I told them the story of my lost cookbook. Unfortunately I couldn’t remember the title. And to confuse the issue, I was convinced it was a world cuisine cookbook. The staff pointed me to the section where it could be and I slowly and carefully read the spines of the books but I didn’t find it. Dejected, I went to the European section to look for Romanian or Macedonian cookbooks. As I slowly read the titles one stood out – my hand shook slightly as I grabbed the familiar looking book. Luckily there was a couch near by and I fell into it. Could this be the book? There was only one way to find out. I went to the index and looked up “Blood Pancakes.” I must say I cried a little when I saw the recipe was there. This was the book!! I never thought I would ever see it again and now I had in my hand. I ran to the counter, waving my credit card. I actually hadn’t even looked at the price! Luckily it was really reasonably priced and I hugged it all the way back to the car. There are so many recipes I can’t wait to try and I’m hoping to share my European cooking adventures with you! 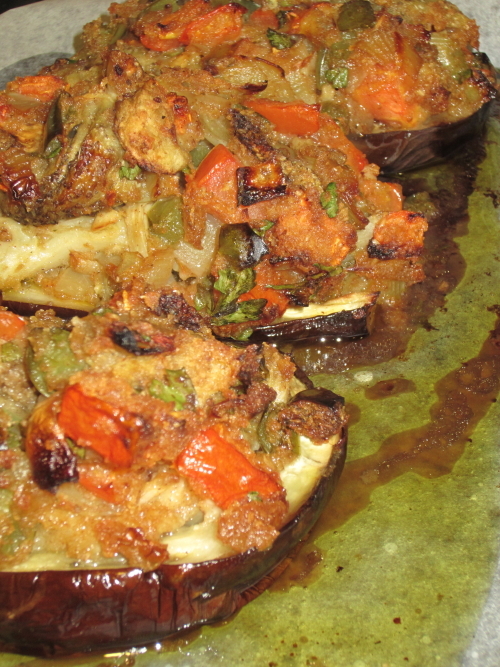 Below is my version of “Imam Bayeldi” or The Imam Swooned, a stuffed eggplant dish simmered in olive oil. And why did the Imam swoon? The popular story is that the Imam found the dish so divinely delicious when he tasted it that he nearly nearly fainted from pleasure. Other versions suggests the Imam nearly fainted at how expensive the dish was to make or at how expensive the ingredients were. A longer version has the Imam marrying the daughter of a wealthy olive oil merchant. Part of her dowry was 12 jars of the finest olive oil. The Imam asked her to prepare his favourite eggplant dish each evening which she did for twelve nights. On the thirteenth night she told the Imam they had no more olive oil for his eggplant dish. He was so shocked he fainted! Preheat oven to 170C / 325F. Wash, dry and cut the stems off the eggplants. Heat the oil in a large frying pan. Gently cook the eggplants for 10 minutes turning half way through. Remove with a slotted spoon and set aside. Add the onions and capsicum to the oil and gently cook for 10 minutes. Cut the eggplants in half lengthways and being careful not to split the skins, scoop out some of the flesh into a medium sized bowl. Remove the cooked onions and capsicums from the oil with a slotted spoon and add to the eggplant flesh. Add the garlic, tomato, parsley, cinnamon, breadcrumbs, salt and pepper and mix thoroughly. Fill the eggplant skins with the mixture. Place eggplants in a small baking dish and pour over the remaining cooking oil. This recipe looks absolutely delicious how lucky you were to find the book and I must say the year it was published was a very good year indeed. Definitely a “faint-worthy” eggplant dish.